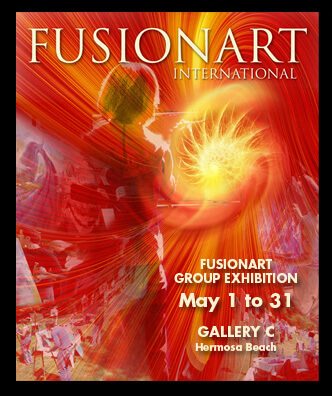 Fusionart International has just opened a new exhibit at Gallery C in Hermosa Beach, CA. This comprehensive showing represents works from most of the artists and features opportunities to meet the artists in person for Brown Bag lunches. The opening reception on May 3rd was a celebration of Fusionart’s transformation into a powerful agent of artistic change. We invite you to visit this extraordinary exhibit and especially to view Ralph’s paintings on display. The exhibit runs may 1st through May 31st. If you are in the beach cities, please stop by and browse. Your soul will be uplifted and enlightened. For more information, please visit the Fusionart website at www.fusionartinternational.com.